This concludes the update of this post – the text below is from the last rebranding less than a year ago. Geeeez. I worked for them as a visual merchandiser, you know? It used to be about selling clothes and linens and things. 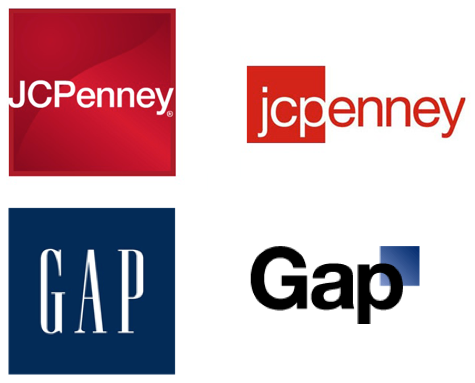 JCPenney has thrown in with all the other brands suffering sluggish performance in the belief that a logo change will make a difference. Changing a logo will never fix a brand’s problems. Why on earth major brands, some of whom have been around since the 1800’s or early 1900’s, think they can slap a new logo up and people will magically start coming into their store or restaurant or grocery or whatever again is baffling. It takes so much more to rebrand oneself, and changes have to come from the top down and within, and an entire company has to get aligned around a new spirit, new messaging, new changes in product line or services, etc. Yet, as we have seen repeatedly and with unfortunate hilarity online lately, companies are changing brands like underwear. One element of ridiculousness in all of this minor hype, is that JC Penney repeatedly referred to themselves as jcpenney in their news release… which does not work to set their name apart as an entity inside paragraphs of text, and just looks plain wrong – like an editor fell down on the job. It also makes it seem like a third-year design student is actually running this rebranding initiative inside the company, as opposed to simply having won branding rights in an upscale crowdsourcing contest – JCP used design schools and ad agencies to do the free concepts for this logo change. Brand New has a compelling argument against this change: “The biggest problem I have with this whole thing is the perception that this is a “bold new logo”. It’s not. It’s rearranging the chairs on the Titanic, reupholstering them if you want to be generous. But bold or new? No way. Looking at the result… as a type exercise it’s actually very decent, it’s well spaced and nicely positioned, can’t argue with that but it is also a confusing visual and verbal nomenclature.” Please read the whole article – it targets many of the problems with this logo change. I will add to that, it’s a box. And Target owns red and white, minimalistic type, bold TV advertising – are they willing to risk being confused with a discount retailer??? Despite JCP’s “red gift box” at Christmas and the “it’s all inside” campaign, the box has negative connotations for me. JC Penney is inside a box of their own making, and has been, for a long, long time. I worked for JCP in my early 20’s as a visual merchandiser (which is why I call them JCP, not because of the new logo – it’s a shortcut I am used to using.) I have wrapped thousands upon thousands of those boxes… not my favorite thing to do as a window dresser! I will forever associate them with blue more than red – maybe that was the prevailing color when I worked there. I ran the risk of becoming a “lifetime employee” when they offered to train me to be a visual merchandising manager, something I thought I wanted at the time. But I looked around and realized that if I did that I might never leave the company. So I quit my job, became a waitress and went back to college, still in search of what I wanted to be when I grew up. It wasn’t until I became a Marketing Director at Whole Foods Market and used a Mac in my daily chores that a plan began to form. To this day, when I go into a JC Penney store, it feels exceedingly familiar – it feels like home. Because there have been no great shifts in their merchandise, no strides forward in the world of merchandising, no great shakeups in the brands they sell or the types of items they carry… all of which would signify an actual and genuine rebranding! To contrast this grand announcement via press release of a logo change that so many companies are doing in a desperate plea for attention, I think of Apple. Apple has changed their logo several times over the past years since Steve Jobs returned to the company. But a new logo has NEVER been the primary driver for announcements – it’s been a smaller, perfectionist detail of major, never-before-done innovation in the product line. When Apple refines the logo, it’s because they actually have ALREADY changed the brand! Their changes come to the public from the inside out – they create amazing products in R&D, refine them in the manufacturing process, test them to death for quality, and then release them, often with accompanying changes to packaging or logos or advertising. But the brand evolution is around what Apple is actually tangibly selling, NOT what a logo looks like on signs, bags or storefront. JC Penney is guilty of a software industry mantra that I’ve often mentioned: “leave no customer behind.” They want to be seen as youthful, hip and modern. But their customers are people like my deceased mother-in-law, who often purchased from their catalog, and who used to work for them years ago when they were here in Garnett, a town of 3500 people. Rural women and families in small-to-midsized towns are who JCP should have kept finding ways to serve, despite economic hardships in these towns and less spending. Closing catalog storefronts was one hindrance to good customer service, but the recent change to cancel all print catalogs could very well hurt them more than help them. For people who aren’t near a larger city where there is a store, and who don’t shop on the internet, they’ve now killed a customer from their database… many of them loyal, long-time customers. And why? To attempt to attract younger people who frankly want hipper, cooler merchandise than JC Penney carries? By brands and designers not in stock in their stores?? Rather than kill all print catalogs and do “Look Books” that force people to buy online, they could have done a purge and possibly saved some customers or at least not alienated them. I would have sent out a postcard saying if you still wanted to receive a print catalog, they had to send it back with an opt-in address (giving people a chance to blow it off, or to make sure they had an updated address.) That would have saved print costs, and if they tied the catalog products to the existing online store inventory it’s just a matter of designing and printing what is online anyway – but making it available to those who are still living and spending, but not doing it online because they don’t want to. Offering people a look book with no pricing or helpful info is an extravagant, wasteful expenditure – I get them all the time, look at the pretty pictures once, and toss into the trash. From the MultiChannel Merchant article, “JC Penney admitted that ceasing the big catalog book hurt total sales more than they expected it would in the second quarter of 2010.” I’m surprised they were surprised! They should frankly be more savvy than this, after years upon years in the retail business. As people get involved with technology, they become superior to those who don’t use it as much but that is so short-sighted. A loyal customer should never be left behind unless you absolutely can’t help it. I fear that this logo change won’t help at all, and the cancellation of services that helped JC Penney grow as large as they have will continue to hurt, and what we are looking at is yet another retailer on a downward slope to inevitable closure. I hope they will do more than just focus on slapping the logo up everywhere and make some other changes that will save the company from being yet another vacated storefront in semi-empty malls. I disagree with a lot of your arguments here. I work part-time at JCP (full disclosure). We actually have many younger customers and are doing a lot more to improve. The new logo is rather unimportant in the grand scheme of things. Sephora cosmetics will be inside JCP soon, and that will attract more upscale customers. Also, Mango is a new brand that JCP has brought in to appeal to a younger crowd that likes stores such as Abercrombie & Fitch or American Eagle. There’s also a lot to be said for the older, familiar brands like Liz Claiborne, a.n.a., St. John’s Bay and Worthington. They are high quality and last many years without fading, stretching or falling apart. That is what our customers care about. High quality merchandise and low prices, along with our customer service. Of far more interest than a new logo is the fact that for the third year in row, an independent organization (whose name escapes me, but may be the National Retail Federation) has polled customers and selected JCP as No. 1 in customer service. Customer service is our first priority and we always survey our customers to find where we might be falling down on the job. It’s not just lip service. Our managers train us in how to provide the best customer service and that the customer is always right. Our goal is to make them happy, day in and day out. That’s why many of our customers shop for 30, 40 and 50 years in our stores. Customer service is very important and like you, I’ve actually delivered it on the store floor many years ago. But service inside the store is just one aspect of what JCP has provided to customers over all the decades that you mention – what about the people who cannot or will not be serviced via the Internet now? Look Books with no real ordering capability will never replace the big catalogs that many customers have relied on for years. I can appreciate that the merchandise mix is changing – I don’t dislike a portion of what is sold there but I have found the things I am interested in personally have diminished over the years (as far as clothing goes.) In terms of home decor, they have many things I’d consider but not getting those catalogs anymore will decrease the chances I will make home purchases. The catalogs did a good job of getting my interest. I’ll weigh in: JC Penney changed its logo? Seriously – I thought I was following this stuff somewhat closely. Maybe there’s something to be said for the fact that they changed a month ago and there wasn’t this hue and cry from the vox populi designocracy. From my perch, I remember just one nugget about JC Penney (beyond what JC stands for): in the book “The Millionaire Next Door,” more millionaires bought Stafford suits from JC Penney than any other suit brand, by far. Why? Insane quality for the price. For a big box retailer like this — less so for Gap — logo and look and feel of stores matters less and less. Brands like Sephora and Mango and Stafford more and more. I agree! A logo is a small piece to the rebranding puzzle and is definitely not going to have a dramatic change on performance. The reality of it all is that JCP is completely out of touch with the younger consumer. They have lost market share year over year to retail outlets like Target, and are scrambling to figure out a game plan to survive. The fact that they worked with the Collegiate American Advertising Federation this year is a sure sign they are looking for fresh ideas and a new perspective. Kudos to my Alma Mater by the way for taking second in regionals with their JCP plan! The logo is just the first step. Next will be repositioning themselves in the market. Great post! No real conspiracy here – I found out about the logo change because this post was getting hit repeatedly and only had time for a short update. The logo reminds me of the American flag – a plus in that it is a long-running American retail store, but a minus in that I highly doubt there are many things at JCPenney made in the USA. This is an issue I feel others will have too. Though I wonder if your firm has something to do with JCP, Christina, having researched who you are, and this is the cause of the snappychops remark, I stand by my comments. I got the catalog in the mail, and it is visually stunning with vastly improved copy. But the logo standing alone does not show all of the many, many elements that make up this campaign. The ads that have been on TV so far are screeching and annoying. And the nod toward “America” is a bit of lip service as we all know that some percentage reaching half or majority of the merchandise is bound to have been manufactured outside this country. Will this be enough to keep JC Penney relevant? I hope so, as some of the stuff in the catalog was intriguing. Will it be enough to make me get in my car and actually go find a store? Probably not. It’s not like I’m not attached to the brand from a sentimental perspective – I began my career there as a young person. Shame on the designers and the creative leads for this CR_AP! Who cares about JCP anyways. Just let it die and let some new fresh store rise out of the ashes. Looks like one of of the comments left here was by one of those creatives. If so, how can you be in a position of leadership and defend your work with wanna-be-creatives filling their silly social-networking-101-blogs to increase there so called professional knowledge? Come on man. If you think you and your firm did good work, why are you seeking approval from freelancers who can’t get a full time job or run a shop? Who cares what they think. Does your client like the results? If so, have a drink with them and look forward to a working with them until the contract expires. Oh BTW, I’ve been in strategic branding for 15 years working with one of the best in the world. He’s laughing right now as I type this! We don’t put our names on any of our comments to keep you guessing. If you’re for real, you probably already know who we are! I wouldn’t respond to this troll-like comment except that you have some facts wrong and I need to correct them in case prospects read your pithy remarks and think you know… well, anything. I am fairly certain you don’t know much of anything based on your ability to find this site/blog yet inability to speak with accuracy about anything going on here. A. We’re an agency, I’m not a freelancer who can’t get a job, I have three partners and a downtown KC office. Google me. B. This is not a “social-networking-101-blog” though I can see how you’d make that mistake, not knowing much of anything. D. I’m pretty sure the creatives who worked on this campaign haven’t read our humble blog. Interesting you make the assumption they are reading it now, since your comments are directed to them and not me. E. I’m so glad you’ve been in strategic branding for 15 years. I’ve been in the business of serving clients since 1993 myself. Before that, I worked at JCP as a visual merchandiser and I do care about their brand, which I state in this post. I am for real, yet don’t know or give a fig who you are since you’re too ashamed of yourself and insecure about your opinions to represent a real person online. Thanks for stopping by today and littering up the internet with your meaningless commentary. I guess it’s a slow branding day, huh? Back to work for me. Adios.